This is a discussion about how to create a dual boot setup with Windows when whole disk SafeBoot (now called McAfee Endpoint Encryption) encryption is employed. This may be the case particularly if one is issued a company laptop that comes pre-installed with Windows and is encrypted. While one can wipe the drive and install a) Linux alone or b) Linux and an unencrypted version of Windows, some sacrifices and risks may exist. For example, company patches and updates may no longer work properly, IT policies may be violated, data is no longer protected, and, if Linux alone is installed, the capability to share files, access company specific intranet applets, and other limitations may be experienced. This article will explain one method for creating a dual boot setup while leaving the company-installed encryption and operating system intact and fully functional. Note: This author only has experience with Windows 7 and an account created in the Administrator group. It is unknown whether this works with other versions of Windows or with reduced user privileges. 1 Why is a solution needed? The situation of a fully encrypted system is a difficult one because even the MBR is encrypted and SafeBoot uses its encrypted bootloader to load the real partition table and load Windows. Thus, if one attempts to simply partition the disk with [c]fdisk, writing the partition table will render one's system unbootable. Likewise, even if there is a free partition, a) one isn't able to update the partition table with the correct type (which is necessary), b) one can't install the bootloader (e.g. grub) to the MBR, and c) even if one installs the bootloader to the partition instead of the MBR, there is no way to make the system aware that such a bootloader exists via the partition table. It is quite a difficult situation to work with. Some are content with using live distributions or running Linux from a flash drive; the primary author of this article found such methods frustrating and limiting. There is also quite a lot of discussion about how to get around this situation,    and thus an article seemed relevant after a firsthand experience and success. Trying to create a "live clone" (full system backup while Windows was running) in order to possess a decrypted copy of the OS, wiping the drive, and then reinstalling the OS to a partition encrypted with an opensource encryption system. This may prevent company patches from operating successfully and may violate policies if a company mandates a particular encryption method. Trying to use dd to simply block-copy everything from one disk onto an external drive, wipe the internal drive and re-partition, and then dd the external drive back to the internal, and dd a backup of the SafeBoot MBR back to the internal drive. This seems a bit risky, and also requires that one have another hard drive at least as big as the original encrypted partition. While not really a solution in the dual-boot category, simply running Linux inside of a virtualization program is a perfectly reasonable solution. It is by far the simplest. The primary author simply doesn't like the idea and wanted a fully dual-boot setup, however he does have VirtualBox setup in Windows to avoid excessive reboots if Windows usage is needed heavily for any particular task. If the issued computer is encrypted with SafeBoot, it will likely contain one primary partition where Windows is installed. We need to shrink this partition in order to make space for Linux. 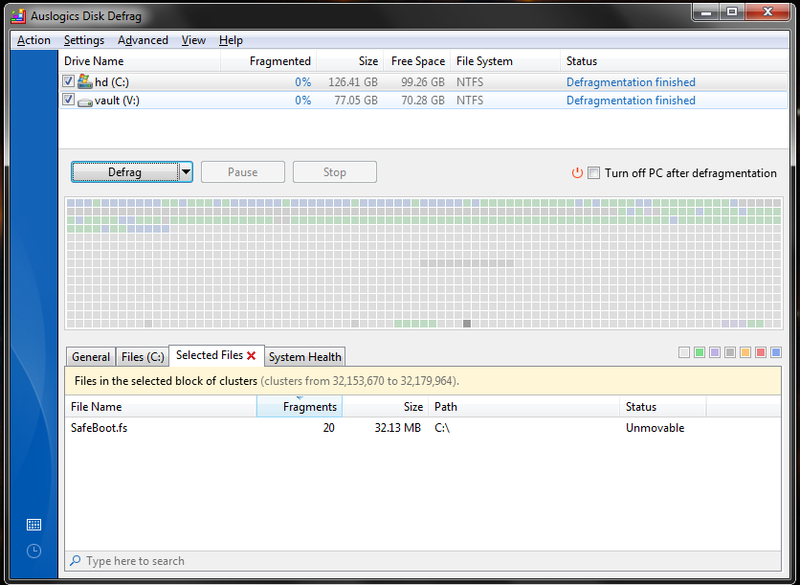 To shrink this partition as much as possible, defragmenting is helpful. Windows 7 comes with a built in defragmenting utility, available through the control panel. Open this program and defrag on the primary drive (probably called C:\). Do this several times, if desired. It may be helpful to use an additional program as well. Wikipedia has a list of various options. The author of this article used Auslogics Disk Defrag, which worked well and had the ability to view what specific files were unmovable. Such files will hinder the minimum size possible to shrink the volume in the next step. For some other options for maximizing the amount one can shrink a Windows partition, see this article. While it is written for Windows Vista, it contains some applicable suggestions for Windows 7 as well. 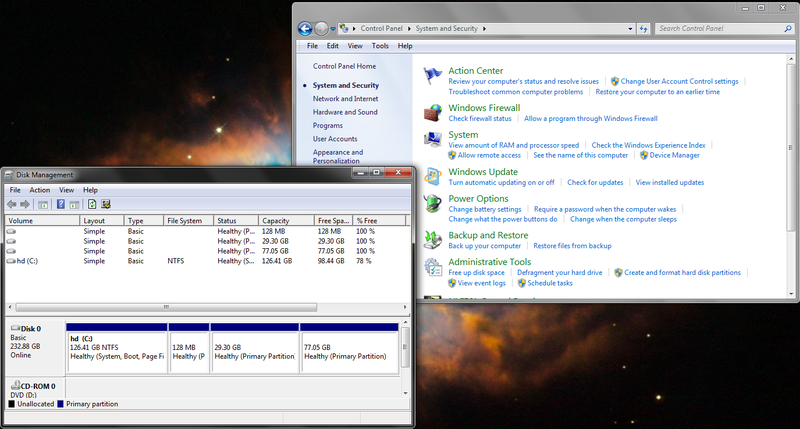 The author of this article disabled system restore temporarily and was able to shrink the partition another 6 GB. Note: After shrinking the partition in the next step, you should undo any system-critical adjustments you made during this step. In other words, re-enable system recovery, paging file, etc. This article or section is a candidate for moving to Dual boot with Windows. TrueCrypt partition: for shared files between Windows and Linux. 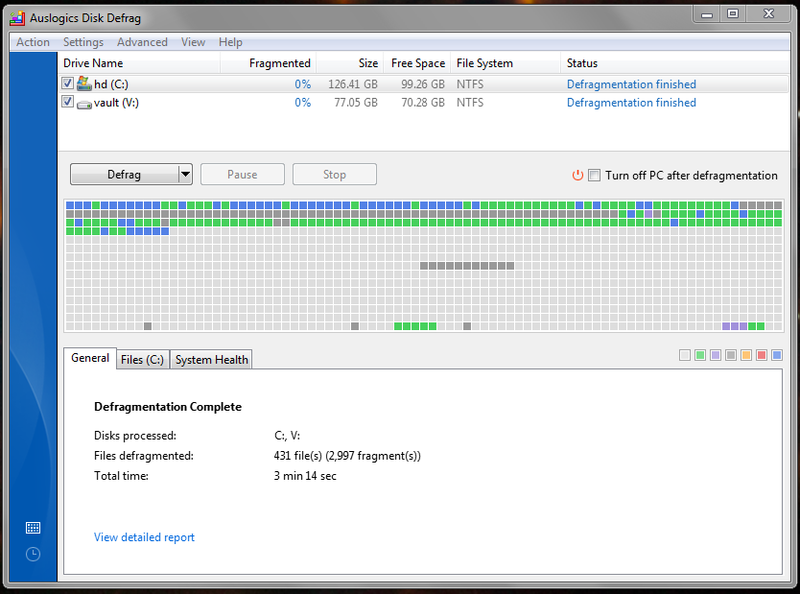 Make it take the rest of the unallocated space. For each of these drives, the format doesn't really matter because they'll all be reformatted. Choose FAT or NTFS and let Windows create the volumes. For a walkthrough on adding volumes from unallocated space, see this article. Note: if the fourth partition added is surrounded by green and denoted as an extended partition, do not worry. Windows 7 does this automatically and we will fix it in the next step. It is now necessary to edit the partition table so that it shows the Linux partitions as actual Linux partitions rather than FAT or NTFS (whatever was created in the last step). Since we can't use fdisk to write the partition table, we'll use a tool in Windows itself. This author used MiniTool Partition Wizard Home Edition, a free partition tool recommended highly by CNET. Open the program and right click on a partition that will contain a Linux filesystem. Choose "Change partition type ID" from the drop down menu. Choose the manual ID entry option and set the type to 0x83, as shown in . Repeat this with any other partitions that will be formatted with Linux filesystems. For a walkthrough on this step, see this article. Lastly, if a fourth partition was created in the previous step, click it, and then go to the Disk menu and choose "Convert dynamic disk to basic disk." This will change the extended partition to a simple one. For a walkthrough on this, see this article. When finished, click the "Apply" button in the upper left of the main window. Next, we're going to add a Linux option to the Windows boot options using a free program called EasyBCD. 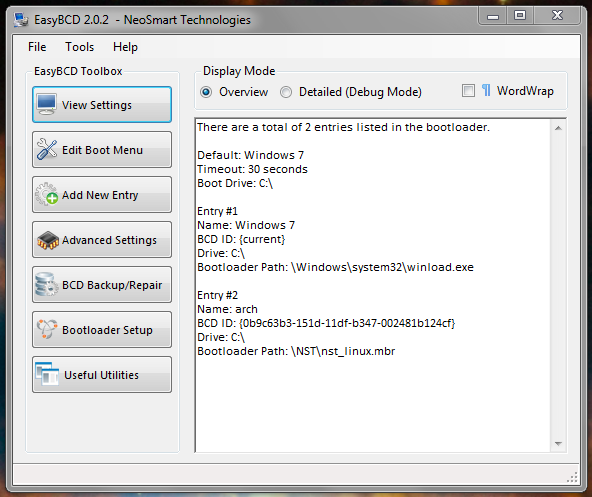 Theoretically, this should be possible using Windows 7's built in program, bcdedit, as shown in . The author had difficulty attempting this due to privilege errors, and was successful with EasyBCD and thus never retried with bcdedit. 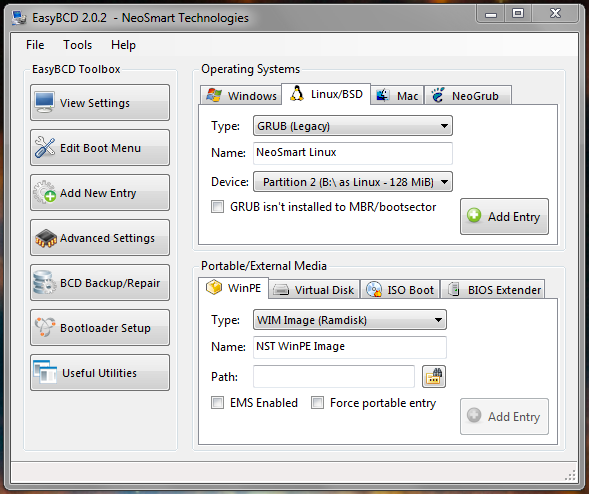 Open EasyBCD and click "Add New Entry" on the left. Choose the Linux/BSD tab and set the bootloader type (Grub (legacy)) for Arch and partition. Make sure that if you are going to have a dedicated boot partition that you point EasyBCD to that partition, not the one that will contain the root filesystem. A screenshot of these settings may be found in . Next view the entry by clicking "View Settings," and make sure everything looks appropriate. For a legacy grub setting pointing toward the second partition on the disk, the boot entry should look like . Note: It is highly recommended that one make a backup of the SafeBoot MBR before proceeding. If anything accidentally happens to it, you can restore it and will have a functioning system. Without a backup, if you use [c]fdisk and write the partition table to the MBR, or install Grub to the MBR, you will lose the ability to ever, ever, ever get back to your Windows installation. Now reboot and things should be as they were. Note: The above example assumes that /boot is on /dev/sda2, which is the second partition on the drive. Since grub starts from 0, this corresponds to (hd0, 1) or first disk (hd0), second partition (,1). See the GRUB article for more information. See Dm-crypt#System configuration for more details. Edit the entry according to GRUB#Dual-booting (don't forget to add the required extra options if using an encrypted system. See System Encryption with LUKS#Install Bootloader[broken link: invalid section] for more details). It this works, then the issue exists in the EasyBCD entry we made earlier. If it doesn't grub may not have been installed to the right location. See NTFS-3G for more information. Note: TrueCrypt includes its own ability to both map and mount an encrypted file or device in one step, however as of version 7.0a (current Arch version as of 4/19/2011), some have reported problems with NTFS formatted devices and mounting. This author has found that the two-step process outlined above (first, using truecrypt --filesystem=none --slot=1 /dev/sda4, and then the system's mount command, mount /dev/mapper/truecrypt1 /mnt) works reliably. The bug report FS#23184 contains more details. Finally, reboot into Windows, install TrueCrypt, and attempt to mount the device. Once verified that both OSs can mount the volume, begin adding any files that one desires to share between OSs. If all of the above goes smoothly, one should have a dual-booting, fully encrypted system (if Linux was installed using the LUKS/dm-crypt method) with the exception of a Linu /boot partition. In addition, both Window and Linux can share files via the TrueCrypt volume. The process seems to be advantageous to other methods in that it does not require juggling of the SafeBoot mbr, using dd or other tools to clone the drive and then clone it back after partitioning, does not require extra external hard drives for such cloning, leaves any company-installed components alone (with the exception of shrinking their footprint), and yet maintains a high level of system security. If one encounters a grub shell but can boot if manually entering the proper commands, reboot into Windows and verify the EasyBCD settings mentioned above. Verify that the bootloader type was correct (grub legacy vs. grub2 vs. others) and that the drive was correct. The drive chosen should be that containing Linux /boot, not the main Linux OS root partition. Do not attempt to install grub to the root Linux partition, as this will wipe the LUKS/dm-crypt header and render the partition unusable unless you have a backup of the header. In other words, be very careful when issuing the command grub > setup (hd0,X) and make sure that X is the boot partition, not the encrypted root partition. If trying to install grub and one sees an error about an unknown filesystem or partition type and the code 0x7, you've either pointed grub to the wrong place (wrong partition number), or did not successfully change the partition type ID. 0x7 is the identifier for NTFS. Reboot back into Windows, open the Partition Wizard discussed above, and manually change the type to 0x83. Then reboot and attempt to install grub again. After issuing grub > root (hd0,1), grub should report back Filesystem type is ext2fs, partition type 0x83. This is what you want. This page was last edited on 26 September 2018, at 14:24.